Heavy metals are ubiquitous elsewhere in nature and their measurement in environment is necessary to develop health management strategies. In this study, we aimed to find out concentrations and spatial patterns of heavy metals in main farms of Sanandaj in Kurdistan, Iran. Over May to October 2012, six farms were selected to analyze concentrations and spatial patterns of several heavy metals, namely aluminum (Al), arsenic (As), cadmium (Cd), cobalt (Co), chromium (Cr), copper (Cu), nickel (Ni), lead (Pb), and zinc (Zn) in their soil, irrigation water, and edible vegetables. Overall, 36 samples of soil and water and 72 samples of vegetables including coriander (Coriandrum sativum), dill (Anethum graveolens), radish (Raphanus sativus) root and radish leaf were collected. The concentrations of metals were determined by inductively coupled plasma optical emission spectrometry. 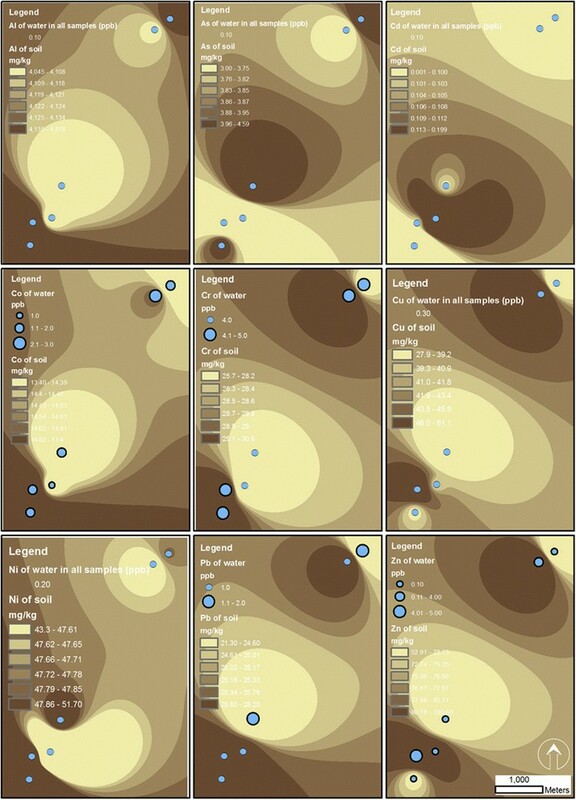 The spatial surfaces of heavy metals were created using geospatial information system. The order of metals in soil was Al > Zn > Ni > Cu > Cr > Pb > Co > As > Cd while in water it was Cr > Co > Zn > Pb > Cu > Ni > Al = As = Cd. The order of heavy metals in vegetables was Al > Zn > Cu > Cr > Ni > Pb > Co > As > Cd. Totally, the minimum concentrations of Al, Cu, Pb, and Zn were found in radish root while the maximum of Al, Co, Cr, and Ni were found in radish leaf. The minimum concentrations of Cd and Cr and maximum concentrations of Cu and Zn were also deciphered in dill. Noteworthy, coriander had the minimum concentrations of Co and Ni. The concentrations of Cr and Pb in vegetables were more than maximum allowable limits of the Food and Agriculture Organization (FAO) and the World Health Organization (WHO). In summary, albeit the concentrations of heavy metals in soil and water samples were below FAO and the WHO standards, vegetables were contaminated by chromium and lead. Heavy metals—those with specific density of about 4-5 g/cm3 or higher—are actually ubiquitous elsewhere in nature. In fact, there are several sources of contamination, namely natural, agricultural, domestic, atmospheric, and other sources . However, tremendous application and utilization of heavy metals in more recent years through industries caused steep emissions to our environment . The main pathways of humans’ exposure to these elements are through air, water, soil and hence agricultural crops . The health effects of heavy metals have been known since ancient history . In essence, toxicity and/or carcinogenicity of heavy metals, such as lead, arsenic, mercury, cadmium, and nickel have been reported in numerous studies -, even in low dose exposures . In brief, they may cause kidney, lung, nervous system, and skeletal damages, such as itai-itai disease -. Diminished intellectual capacity, gastrointestinal symptoms, coronary heart disease, variety of cancers, such as renal, skin, and bladder cancers, and even death have been also associated with chronic and/or acute exposures to heavy metals ,-. Some of heavy metals, such as iron, copper, and zinc are present in trace amounts (10 mg/kg, or mg/l) or ultra-trace amounts (1 μg/kg, or μg/l) in environmental matrices as they are essential for biochemical and/or physiological functions. However, quantities beyond the requirement of living organism may lead to its toxicity . Overall, majority of heavy metals daily intake in humans is from diet, mainly through crop plants ,. It is well recognized now that certain species of plants tend to bioaccumulate heavy metals -. For instance, Maleki and Alasvand Zarasvand  reported that lead, copper, chromium, and cadmium were present in edible vegetables, such as leek, sweet basil, parsley, garden cress, and tarragon in Sanandaj, Iran beyond the allowable national standards. In addition, Mohajer et al. declared that most plants grown in Isfahan, Iran had heavy metals more than international standards in which 48 and 75 percent of vegetable samples had concentrations of cadmium and lead beyond the Food and Agriculture Organization (FAO) and the World Health Organization (WHO) guidelines. Eslami et al. determined high levels of cadmium and lead in parsley, leek, radish leaves and roots, and sweet basil, which were well above the maximum threshold values recommended by FAO and the WHO. Pourang and Noori  also analyzed heavy metals in various plant species of an agricultural area near Tehran and reported that chromium, cadmium, and lead were substantially above national and international guidelines in most of vegetables, especially in onions. Cadmium and lead were again principal culprits in cucumbers and bell peppers grown in greenhouses of Qom, Iran . Besides, there are many similar studies from China, Ghana, and other countries that measured heavy metals in agricultural soils, irrigation water and/or their crops -. The excess presence of heavy metals in edible vegetables that people consume, as reported by numerous researchers, may pose a health threat to general population. Therefore, it is essential to monitor their concentrations in vegetables. Moreover, measurement of heavy metals in irrigation water and also agricultural soil may help to better understand sources of contamination and consequently develop effective management strategies. The application of Geospatial Information System (GIS) technology also has been proposed by other researchers to identify spatial distribution of trace elements and sources of pollution ,. Therefore, in this study, the authors aimed to decipher levels and spatial patterns of heavy metals in soil, irrigation water, and edible vegetables of farms in Sanandaj, Kurdistan, Iran. Sanandaj is capital of Kurdistan province in North West of Iran. The city is developing and non-industrialized . However, there are various small industries and workshops, such as welding of metals and plating, small tanning industries, etc., which are mainly located in southeast region. There are several farmland areas in outskirts of the city near Sanandaj’s small river, located also in southeast region (Figure 1). Nevertheless, there are six major farms for cultivating vegetables around the city and we included all of them in the study. Over May to October 2012, we selected these six farms to analyze levels and spatial distribution of several heavy metals, namely aluminum (Al), arsenic (As), cadmium (Cd), cobalt (Co), chromium (Cr), copper (Cu), nickel (Ni), lead (Pb), and zinc (Zn) in soil, irrigation water, and edible vegetables that they produce. The sampling was done over this period as it is suitable for planting and harvesting of vegetables in Sanandaj. Study area and location of sampling sites in Sanandaj, Kurdistan, Iran. Overall, 18 samples of soil were collected bimonthly during study period (6 farms × 3 times). For each sample at each farm, a mixture of sub-samples was collected to form a composite soil sample to be representative of the whole farm. In detail, a hole of 25 cm was dug using a clean stainless steel trowel and three to four slices of soil from top to bottom were sampled and preserved in a clean bag. The bag was labeled and transferred to the laboratory ,. The farms were irrigated by groundwater. Overall, 18 samples of water were collected bimonthly during study period. In detail, sampling was done using a 500 ml washed polypropylene bottle. Noteworthy, 1 ml of nitric acid was added to the samples to avoid microbial activity ,. The four commonly produced vegetables of these farms were selected for sampling including coriander (Coriandrum sativum), dill (Anethum graveolens), radish (Raphanus sativus) root and radish leaf. Overall, 72 samples of vegetable were compiled bimonthly during study period (6 farms × 4 vegetables × 3 times). A mixture of six sub-samples at various distances (10 m, 30 m, 50 m, 70 m, 120 m and 140 m) was collected for each sample to form a composite sample of vegetables at each farm . The soil samples were oven dried at 80°C at laboratory until stable weights were obtained. Thereafter, they were crushed using a porcelain mortar with a pestle and mixed thoroughly until they could be sifted through a 10 mesh sieve. For heavy metal analyses, about 100 g of each soil sample was separated out, transferred to a beaker, and as stated in the SW-846, 3050 method of EPA, analytical degree of HNO3 and H2O2 (30%) were applied for soil digestion. The vegetable samples were transferred to laboratory and washed with distilled water to remove mulch or soil. In order to remove excess moisture, samples were air dried for approximately two weeks. Afterwards, using a porcelain mortar and a pestle, samples were grounded until they could be sifted through a 10 mesh sieve. For heavy metal analyses, about 1 g of each sample was separated out and transferred to a Pyrex beaker. Then, 10 ml of mixture of acids including HNO3, HClO4 and H2SO4 in ratio of 1:1:1 was added to the beaker and maintained at laboratory for 24 hours. After this lag, the beaker was heated at 95°C on hot plate until volume was reduced to 10 ml. Again, 10 ml of acid mixture was added and until reaching to 4 ml was heated. Afterwards, 50 ml of deionized water was added and the digest was filtered. Finally, 100 ml of solution was made by adding double deionized water ,. The concentration of heavy metals in soil, irrigation water, and vegetables were determined by inductively coupled plasma optical emission spectrometry (ICP-OES) (Model SPECTRO ARCOS, SPECTRO Inc.; Germany). In detail, torch type of apparatus was flared end EOP Torch 2.5 mm; detector was CCD; nebulizer type was cross flow; nebulizer flow was 0.85 l/min; plasma power was 1400 W; coolant flow was 14.5 l/min; and pump rate was 30 RPM. Meanwhile, physicochemical characteristics of soil including pH, EC, total neutralizing value, organic carbon, K, P, soil texture, bulk density, and soil particle percent were analyzed according to the standard methods. All geographic coordinates of sampling points were recorded using a Global Positioning System (GPS) device (Garmin, Garmin International Inc.; Kansas, USA). Next, a GIS was established and using Spatial Analyst extension to ESRI’s ArcMap 9.3 GIS (ESRI, Redlands, CA, USA), spatial surfaces of heavy metals in soil and vegetables were created by interpolation method. The applied interpolation method was Inverse Distance Weighted (IDW). Descriptive statistics, such as minimum, 25%ile, median, 75%ile, and maximum were presented by box plots. In addition, mean and standard deviation were calculated. We calculated all statistical analyses by STATA software (STATA Corp., TX, USA). The concentrations of heavy metals in soil samples including Al, As, Cd, Co, Cr, Cu, Ni, Pb, and Zn are shown in Table 1. The order of heavy metals presence in soil samples was as follow: Al > Zn > Ni > Cu > Cr > Pb > Co > As > Cd. Interestingly, heavy metals of soil in none of the cases exceeded international standard levels, such as Austria, and the European Union standards (Table 1). Results of physicochemical characteristics of soil samples are shown in Table 2. Importantly, pH of soil samples in all cases was circum-neutral to alkaline with the minimum of 7.8 and the maximum of 8.1 (Table 2). 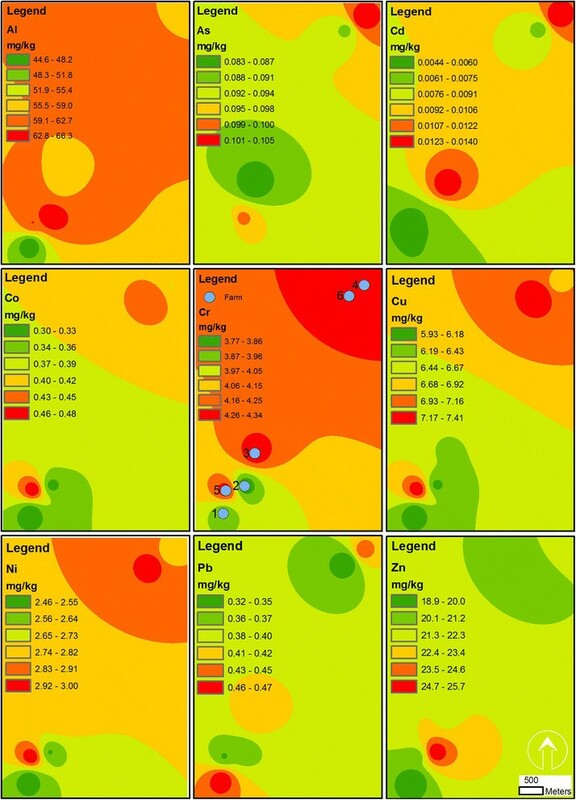 Figure 2, meanwhile, shows spatial pattern of measured heavy metals in soil samples of farms in Sanandaj, Kurdistan, Iran. Spatial patterns of heavy metals in soil and irrigation water of farms in Sanandaj, Kurdistan, Iran. Table 3 shows the concentrations of heavy metals in water samples of farms in Sanandaj, Kurdistan, Iran. The order of heavy metals presence in water samples was as follow: Cr > Co > Zn > Pb > Cu > Ni > Al = As = Cd. The concentrations of Al, As, Cd, Cu, and Ni were similar for the six farms. As shown in Table 3, heavy metals of water samples in none of the cases exceeded international standard levels, such as Austria standard. Additionally, results of physicochemical characteristics are shown in Table 4. The pH of water samples in all cases was also circum-neutral to alkaline with the minimum of 7.6 and the maximum of 8.1 (Table 4). Meanwhile, spatial patterns of measured heavy metals in water samples of farms are shown in Figure 2 by graduate symbols. aReprint from Maleki et al. with written permission. Abbreviations: EC Electrical Conductivity, TDS Total Dissolved Solids, NTU Nephelometric Turbidity Units. Table 5 tabulated the mean concentrations of heavy metals in vegetable samples of farms in Sanandaj, Kurdistan, Iran. Besides, descriptive statistics including the minimum, 25%ile, median, 75%ile, and maximum of heavy metals in vegetables are illustrated in Figure 3 as box plots. The order of heavy metals presence in coriander and dill samples were similar and as follow: Al > Zn > Cu > Cr > Ni > Pb > Co > As > Cd. The order in radish leaf was as Al > Zn > Cr > Cu > Ni > Pb > Co > As > Cd and in radish root samples was as Al > Zn > Cr > Cu > Ni > Co > Pb > As > Cd. Overall, the order of heavy metals for vegetables was as follow: Al > Zn > Cu > Cr > Ni > Pb > Co > As > Cd. In general, the minimum concentrations of Al, Cu, Pb, and Zn were found in radish root while the maximum of Al, Co, Cr, and Ni were found in radish leaf. The minimum concentrations of Cd and Cr and the maximum concentrations of Cu and Zn also were deciphered in dill. Noteworthy, coriander had the minimum concentrations of Co and Ni (Table 5). 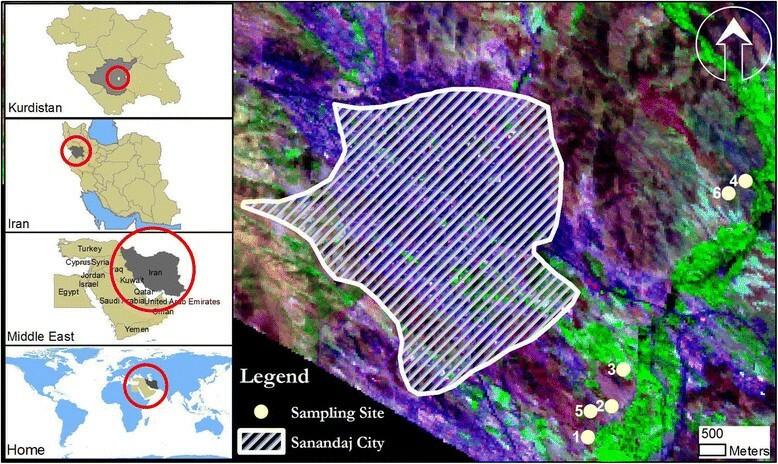 Figure 4 shows spatial distribution of measured heavy metals in vegetable samples of farms in Sanandaj, Kurdistan, Iran. aPartly reprint from Maleki et al. with written permission. Heavy metals of vegetables in farms of Sanandaj, Kurdistan, Iran. Spatial patterns of heavy metals in vegetables of farms in Sanandaj, Kurdistan, Iran. In this research, we characterized the concentrations of several important heavy metals in agricultural soil, irrigation water, and vegetable crops of six farms in Sanandaj, Kurdistan, Iran. We further depicted spatial distribution of these heavy elements in the studied area. In general, we know now from our wide literature that levels of each heavy metal in soil is controlled by several interactive complex factors, such as pH, organic matter, cation exchange capacity, clay constitute of soil, and concentrations of aluminum and iron content . More importantly, these factors, especially pH, would affect bioaccessibility and bioaccumulation of these heavy elements in plants. While aluminum is one of the most abundant elements in soil, its availability for crops is dependent on pH ,. It is believed that soluble aluminum, which is absorbable by plants, is present in soil pH below 5.0, where rarely this pH is suitable for agriculture . Noteworthy, aluminum has been classified as a contaminant of potential concern only in soils with a pH of 5.5 or less . This may be the reason why no standard have been set for aluminum in soil (Table 1). However, the unexpected result was that aluminum became the first rank in vegetables of Sanandaj (Table 5 and Figure 3) while pH of soil was circum-neutral to alkaline (Table 2), which means aluminum has been absorbable in soil pH above 5.5. Meanwhile, the minimum and the maximum concentrations of aluminum among the four tested vegetables, respectively, were found in radish root and radish leaf, which means radish leaf may contribute to the maximum intake of aluminum to Sanandaj’s residents through consumption of tested vegetables. Interestingly, the concentration of aluminum in irrigation water samples, which was 0.1 ppm, is much lower than Austria's standard for irrigation water (5000 ppm). The concentrations of all measured heavy metals in soil and irrigation water were below maximum allowable international standards, while in vegetables the concentrations of chromium (4.2 mg/kg) and lead (0.4 mg/kg) were more than the allowable limits, which are 2.3 and 0.3 mg/kg, respectively (Table 5). The presence of small industries/workshops in the proximity of the farms may be sources of these contaminations. However, this interpretation will be dubious as the concentrations of all heavy metals in soil and water were below the maximum allowable standards. Another reason for lead contamination of vegetables may be that these farms are located near major roads, which may cause air pollution and produce fine particles containing lead. However, it is more than 10 years that pb has been removed from petrol of Iran because of health-related issues . The other interpretation, which is more credible, is presence of Middle Eastern Dust (MED) events in this region ,. In fact, during last decade the welkin of about 11 provinces of Western and South Western Iran have dramatically changed because of MEDs, which is believed originate from deserts of Iraq and Syria ,. Although we could not find any study to date in Sanandaj that evaluate ionic composition of the MEDs, especially heavy metal composition, and as the samples of soil and water were not contaminated by heavy metals, the contamination of vegetables by chromium and lead may be due to the MEDs. In any case, chromium is toxic for most plants and affect seed germination ,. Moreover, chromium compounds have been considered as carcinogen for humans . Long-term exposure to lead, also, is associated with decreases of intelligence capacity in children . Thus, it is essential to inform Sanandaj's population that chromium and lead contaminated vegetables of these farms. In detail, none of the sampled vegetables was safe to human consumption. However, the order of presence for chromium in vegetables was radish leaf > coriander > radish root > dill. For lead, the order was dill = coriander = radish leaf > radish root and radish root had a boundary standard lead content for consumption (Table 5). Overall, radish root and dill had lower concentrations of heavy metals than radish leaf and coriander in Sanandaj. On the other hand, Finster et al. have found that lead tends to concentrate more in radish roots rather than shoots in Chicago, USA. However, the same was not found in Sanandaj . As shown in Table 5, coriander and dill absorb copper at higher rates than chromium, while for radish root and radish leaf it was reverse. All of the vegetables, except radish root, absorb lead at higher rates rather than cobalt. Meanwhile, all of the vegetables were poor absorber of arsenic and cadmium. It is noteworthy that Sipter et al. have found that sorrel, carrot, and onion absorb cadmium and zinc at higher rates than lead. Although zinc was the most absorbed heavy metal after aluminum in Sanandaj’s sampled vegetables, lead and cobalt were absorbed at higher rates than cadmium. As illustrated in Figure 4, the vegetables of northeastern farms had more concentrations of aluminum, chromium, copper, and nickel while other measured heavy elements were lower in southwestern sites. In conclusion, despite the concentrations of measured heavy metals in soil and irrigation water were below the international standards, the concentrations of chromium and lead in vegetables were higher than FAO and the WHO standards. The authors would like to thank staff of the laboratory at Faculty of Health, Kurdistan University of Medical Sciences, for their wholehearted cooperation. This research was financially supported by Kurdistan University of Medical Sciences; thereby we acknowledge. AM designed the study, supervised the sampling and analyses, and revised the manuscript. HA conducted statistical and GIS analyses, and drafted the manuscript. SN and SZ conducted experimental analyses in laboratory. AHM supervised the study. All authors read and approved the final manuscript.